Mobile Banking is the ultimate on-demand service. With it you can now monitor your accounts using your mobile phone... receive alerts, view accounts, even make deposits, whenever you need to. Wherever you happen to be, you decide how you'll use it. Request a text message be sent if your balance falls below $50 or when your direct deposit is in your account. Get a customized application for your device that provides an intuitive and rich user experience consisting of easy-to-navigate screens and menus. Receive all the benefits of mobile browser banking enhanced by your device's unique features. With the TBOW App, there's no need to visit a branch to make a deposit. We're as close as your mobile phone, ready to receive your deposit any time of day or night. Making a deposit is as easy as taking a picture. Mobile Banking is as secure as a vault. With multiple layers of authentication, you won't have to worry about the wrong people getting your information. A personal password and phone activation code keep your information safe. 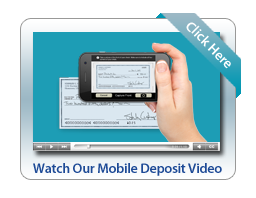 Mobile Banking is available to anyone currently enrolled in our online banking service. To enroll, log on to online banking and select TBOW and then Sign Up. The Apple logo and iPhone are trademarks of Apple Inc., registered in the U.S. and other countries. App Store is a service mark of Apple Inc.